Someone has discovered Coca-Cola’s not-so-big big secret: It’s is absolutely disgusting. And I don’t mean in the taste sense because obviously we know it’s delicious. Since the companycontinually globalizes itself, people of all ages and races drink Coke and have been doing so for decades. Coca-Cola does a good job of marketing its products on a world scale and embodying diversity and unification, which lots of people seem to buy into and genuinely enjoy. Behind their cheery and optimistic commercials, though, is a product that I easily never want to drink again after watching this video by Russian YouTuber CrazyRussianHacker. 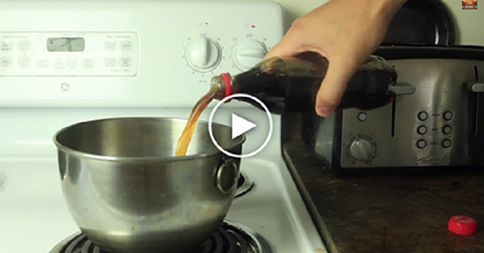 CrazyRussianHacker decided to boil a small bottle of Coke and see what happens. Skip to 0:59 if you want to get to the actual boiling part. Prepare to be incredibly repulsed. I’m serious. This is treading NSFW waters.